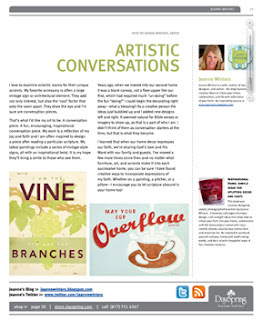 Inspiring Ideas with artist Jeanne Winters: Bloggers, Stories, Christian Gifts and ... COUPONS! Bloggers, Stories, Christian Gifts and ... COUPONS! DaySpring just started publishing this cool magazine full of bloggers! Yes - and I'm in it! My "blog post' is on page 23 and my art is here and there on some other pages. It's kind of a catalog, kind of a magazine, kind of a blog - but it's very diverse, interesting and uplifting! It's full of "celebrity" bloggers and I know you'll love it! 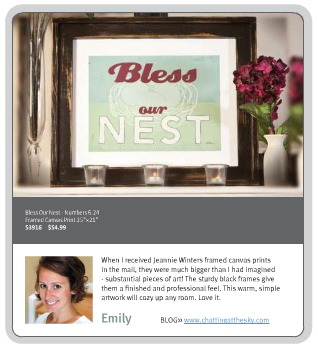 Click on the "Blog-a-zine" button to see the catalog online. You can also order a printed version from DaySpring. AND the back page of the Blog-a-zine has COUPONS!! Start your Christmas shopping! I loved reading the blog-a-zine when it came in my encouragement cards pack. Loved seeing all the bloggers I read in that format. Congratulations to you! You are always inspiring, just like your blog name. I'm going to check this one out. Thanks for sharing. Good work on this blog i am so glad to see all this its help me a lot thanks for sharing.